Miltary coup in Poland by Marshal Jozef Pilsudski in May 1926 and the history behind it. From autumn of 1925 until Brzesc Trial in 1931. Historical events carefully restored in the form of a fabulous film. Oficerowie domagaja sie powrotu Pilsudskiego do wladzy. Jest jesien 1925 roku. Na wiosne wybucha kryzys rzadowy. Witos tworzy rzad, rozbity Sejm nie jest zdolny do pracy. Pilsudski postanawia przejac wladze; 12 maja rusza na Warszawe, majac poparcie lewicy. Po walkach Witos sklada dymisje. On i jego zwolennicy sa represjonowani, a Sejm jest bezsilny. Po rozwiazaniu Sejmu dzialacze "Centrolewu" zostaja aresztowani i osadzeni w Brzesciu. Staja przed sadem; po sfingowanym procesie zostaja skazani na wiezienie. Polska zaczynaja rzadzic wojskowi. Kronika historyczna, odtwarzajaca przebieg przejecia wladzy przez Pilsudskiego i jego zwolennikow. Dialogi sa cytatami z dokumentow historycznych, postacie sa autentyczne, przebieg walki o wladze tez jest odtworzony dokumentalnie. Cast: Ryszard Filipski, Ignacy Gogolewski, Andrzej Hrydzewicz. J�zef Pilsudski is beloved by many for bringing Poland back on the map at the end of the World War I. 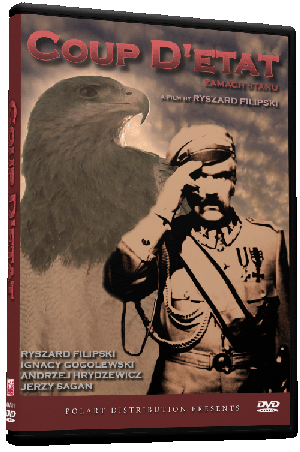 Coup D'Etat (Zamach Stanu) shows us a less flattering portrait of Pilsudski. This film focuses on Pilsudski's 1926 coup in which he overthrew the government he saw as inefficient and quarrelsome. In addition to the coup, the suppressing of those Pilsudski's viewed as a threat to the government and their trail is shown. Even in this movie, which obviously shows the worst of Pilsudski, his likeability and genius shines through. Ryszard Filipski plays the role of J�zef Pilsudski exceptionally well, even looking like him. Interestingly enough Filipski also directs Coup D'Etat. All in all, a degree of neutrality might have been attempted but the events are incriminating enough to cast a foul shadow on Pilsudski. Keep in mind the movie was made in 1980, when Poland was satellite of the Soviet Union, and the Russians had little love for Pilsudski because of his actions in the Polish-Soviet war. It is not surprising a movie that deflates Pilsudski's fame was made at this time. Regardless of one's take on the politics of the time, the events are a dark page in Polish history. The movie nearly feels like a documentary with exact names and places given and does not rush though the events as it runs nearly three hours in length. Coup D'Etat is a good movie for those interested in Polish history as its history is sure to be tumultuous and dramatic.